The 2011 American Eagle Silver Proof Coin continues a series of strikes that debuted in 1986 and have been struck annually ever since (with the exception of one year). The US Mint released the coins for sale to the public on June 30, 2011. These coins are struck as the collector versions of the Mint's extremely popular American Eagle Silver Bullion Coin. However, these coins are struck to proof quality with a mintmark and are sold directly to the public by the Mint whereas the bullion coins are struck to bullion quality, contain no mintmark and are sold through the Mint's network of authorized purchasers. The coins do contain the same designs. 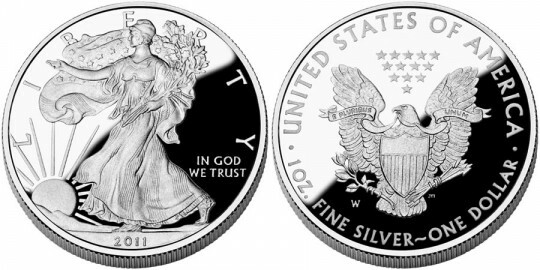 2009 is the only year in which the Mint did not strike these Proof Eagles. They were cancelled as the Mint struggled to meet record demand for the bullion Eagles, which it was required by law to do so at the time. Adolph A. Weinman's "Walking Liberty" design is showcased on the obverse of the coin. Considered one of the most beautiful designs to ever grace an American coin, it first appeared on the Half Dollar from 1916-1947. Also shown are the inscriptions "Liberty," "In God We Trust" and the year. A Heraldic Eagle with shield, meant to symbolize strength and endurance, is shown on the reverse as designed by John Mercanti. Carried in the beak of the eagle are the words "E PLURIBUS UNUM". Also visible around the edge are "UNITED STATES OF AMERICA", "1 OZ. FINE SILVER" and "ONE DOLLAR".